Home Christmas christmas gift christmas presence christmas season christmas tree gifts giving model wishlist yuletide yuletide symbols Yuletide Symbols V: "Gifts and Giving"
Seven days to go before Christmas...have you received your gifts?! Well, Christmas won't not be complete without gifts and giving! Actually it is the gift that really put the spirit of Christmas into life! Now on my fifth Christmas special, join me as I open my gifts to all of you! Do you have your wish list with you? It's Nice To Be A Christmas Model! Which Of These Is Mine?! Every Christmas, everyone of us gives gifts to our love ones. If you have lots of friends, well expect for more gifts! 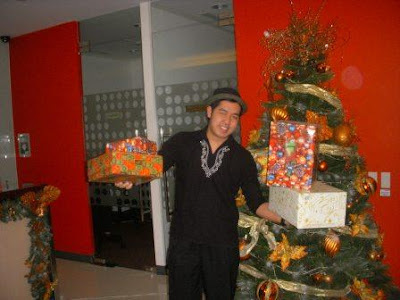 Actually here in our office and even in my previous office, each of my teammates gives gifts to all of us during Christmas. My working area was really full of different gifts wrapped in a Christmas wrapper. In addition to this, we also received other more special gifts from our special someone! Wow! Well, these were just some of the experiences we had during Christmas! It really hard to find the right gifts your recipient wishes! But if I were to ask, which of these Christmas gift-giving do you like best, monito-monita, kris-kringle, exchange gift, or any other more that I haven't mentioned yet! So Many Gifts I Have Received! Thanks! Hey, Where Is Your Gift For Me?! Posing On The Christmas Tree! 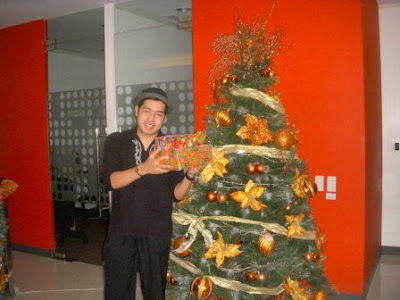 And another tradition for gift is that everytime we received gifts, we immediately place it under our Christmas tree. Actually the bottom of our Christmas trees were all intended as a storage for gifts! Hmmm...did you know why we put our gifts under the Christmas trees? Or do you have an idea where this tradition came from?! For some after they received the gift, they immediately open it in front of the giver. But in my case, after I received the gift, I keep it and wait for the Christmas day to come before I open it! This is my style so that I really feel the suspense of the gift I didn't know! And for some, they totally destroy the wrapper after opening the gift. But others open the gift so gently avoiding it to destroy specially those expensive wrapper type! In addition to this, have you heard of recycle gifts?! What's your idea about this?! Give Love On Christmas Day!!! Well, give me my gift first! You are well-paid than me.